Looking for some fun Thanksgiving coloring pages, crafts, and party ideas for your class? 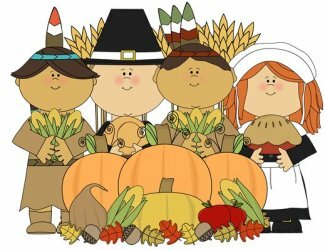 I'll be adding new Thanksgiving crafts and activities all November long, so be sure to bookmark this page for new worksheets or use the social media buttons to get new coloring pages in your News Feed. Each year I like to start the new set of worksheets off with coloring pages. Our preschool-aged kids love coloring, so I try to add more pages every year. Be sure to check them out (there are a few different sets available) before you move on to the activities and crafts. There are currently three sets of coloring pages to choose from. The first set features the quality clipart found at MyCuteGraphics.com. The second features user-generated content from classroomclipart.com. While the turkey pages combine artwork from multiple sites. You can learn more about the clipart images I use for worksheets here. Here are a few ideas that you might be able to use for a classroom party or just as something fun for your nieces and nephews to do at the "Kids' Table" during Thanksgiving dinner. The Thanksgiving Word Searches and Word Scrambles are simple activities that can be printed and handed out to the younger members of your family for something fun to do. The picture scrambles can be a bit messier-they involve cutting and pasting so be sure to supervise younger children. The crafts can be a fun way to bring the family together. You can all take turns writing down what you're thankful for on the "Blessings Turkey" or print out some of the bingo cards for a fun game around the table. The winner gets an extra piece of pie! Have fun and enjoy your Thanksgiving.